Earlier this week, President Obama gave the climate speech he should have given in 2009 and ordered the Executive branch to reduce carbon almost wherever it could. More importantly, he came out from behind the thin scrim of happy-talk about green tech jobs he’s been hiding behind and dealt with the issue on moral grounds. About time. The economic argument for climate change action has always been a miscalculation. (It was also perhaps slightly racist and xenophobic— “look out for the Chinese!”—but we’ll set that aside.) 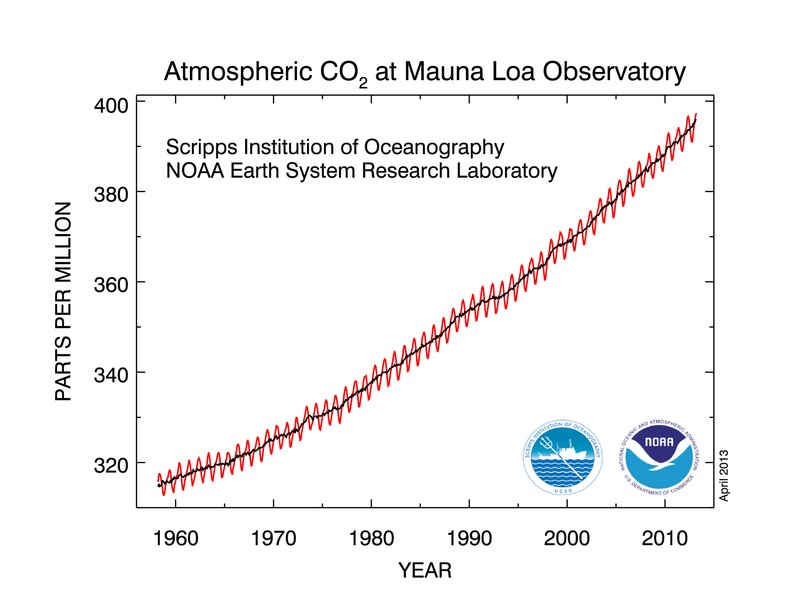 Even if he succeeded in duping climate-action resistors into thinking that the underlying issue isn’t carbon reductions, the result would have been exactly what we’ve seen throughout his administration: uncoordinated, incremental action rather than the WW2-style focus we need to flatten the carbon accumulation curve. We can flatten that curve only if we strongly agree it needs to be done. That’s going to take deep-seated, culturally grounded inspiration. Instilling vague fears that the Chinese are going to dominate the green tech sector was never going to cut it. If anything, a Chinese boogeyman just drives people to strengthen the short-term economy (read: fossil fuels) and pour money into national defense, while undermining any potential cooperation with our would-be adversaries. But we’ve heard strong talk from Obama before. 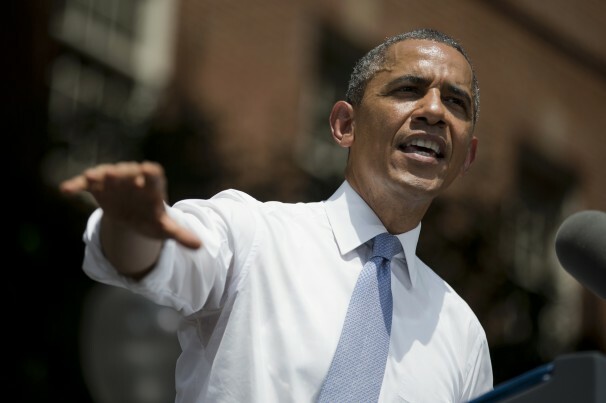 The latest is backed up by a few executive orders, but there’s the matter of follow-through. Some of his other bullet points are aspirational (“my budget once again calls for Congress to end the tax breaks for big oil companies”), and some are perverse (“America’s poised to produce more of our own oil than we buy from other nations. And today we produce more natural gas than anybody else”). I don’t see how he can approve KXL after that comment. But even if he does, that may not be the most telling indicator. That role falls to the Energy Information Administration. Each year it publishes its Annual Energy Outlook, which forecasts energy production and consumption for the next 25 to 30 years. Given the politics around energy, and the sheer level of uncertainty, the EIA is very conservative with these forecasts. They extend current trendlines based on actual data and on-the-books laws, regulations, and orders. So will the President’s orders be taken seriously? Will they have begun to be implemented such that the EIA alters its trendlines? Here’s the EIA’s current project- ion. 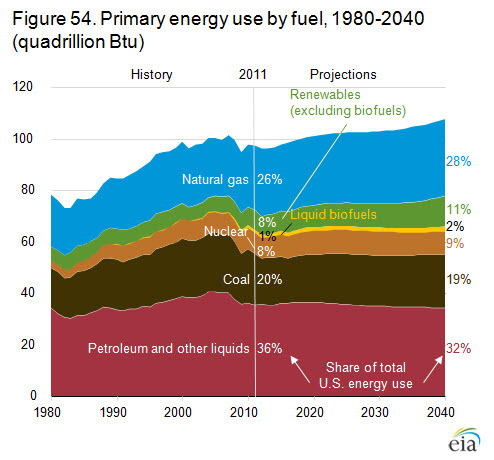 Coal and oil use decreases slightly by 2040 (2040!). Natural gas use increases. Renewables increase by a whopping one percent. And overall, energy use increases, which indicates the short shrift conservation and efficiency get in the world of energy policy—which is really the world of fossil fuel policy, and will still be so, even in 2040, according to the EIA. If the 2014 Annual Energy Outlook next April (or the early release version in January) doesn’t show a downtick in the fossil numbers, that will tell us volumes. And none of it will be good.